I am having a wonderful discussion with Pekka Ihanainen regarding his article (citation below) on time in online education. We are discussing this primarily through the comments section of the original response to the article I drafted up. I was having difficulty with the size of the comments themselves (small type) so I wanted to bring it back here with a larger screen. I also posted to the comments section of the original response, but thought it deserved some more visibility. Pekka makes some fantastic points regarding the role of complexity and simultaneity in learning (often leading to serendipity), the role of presence, trust, authenticity, and more. I have put Pekka’s comments as quotes to separate our dialogue. Coexistence is really important here as yes, simultaneity requires things happening at the same time and those things might be contradictory. Coexistence implies a natural state of complexity, of being compatible with that state. I think this poses a unique view for the modern learner. Dealing with that contradiction and simultaneity and opting for coexistence. Sounds like an ideal paradigm for learning. With all that interaction some learning and innovative thought is bound to happen. Let me break apart your next comments on PoS into parts so it is more manageable, but I wanted to say first that I think a pedagogy of simultaneity is something I would love to explore with you more. Yes, a trust in pedagogically fertile scenarios even when complex thought processes have yet to be seen or understood fully. Searching for the optimal environment and then trusting in its transformative effects (even if it seems contradictory on glance). Absolutely, presence is a big factor here. To be present (intellectually, emotionally, socially, functionally), to actively look for opportunities to be present in complex, challenging environments, there is some pedagogy there for sure. To view learning as process and this first step is trust (in the transformative effects of simultaneity and complexity) and the second step is presence (just jumping right into the madness!). I think presence is particularly important here when dealing with simultaneity, present in multiple viewpoints/activity structures at the same time, even if those produce contradictory results. This is really well written and good for thought. I love the line “when I’ve had the courage to go according to immediate authentic process”. Absolutely, and this speaks a bit to the presence part. To know this complex scenario will transform me, to trust in this transformation and be present in it, and then to allow it to carry me towards authenticity. This all makes perfect sense to me (and it helped clarify my thoughts as well). I do believe this is really the essence of modern learning, this repositioning of self in learning scenarios full of divergence and complexity. 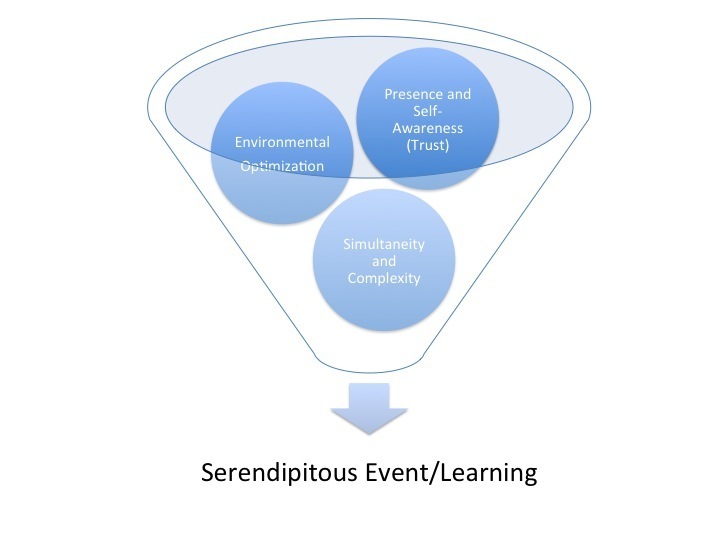 Trust in yourself, trust in your learning environments (once they are optimally tuned), and then trust in your compass (a call for serendipity). This process is learning defined. Agreed, mobile is fast losing impact as a defining principle precisely because it is so ubiquitous, but it certainly helps to counter it against an old, industrial model of education. This is a great exchange; hopefully, we can continue to flesh this out more. This is so beautiful – or at least seductive … 🙂 …I really like these:”trust in transformative effects of simultaneity and complexity”,”present in multiple viewpoints/activity structures at the same time””This repositioning of self in learning scenarios full of …”and particularly”trust in yourself, trust in your learning environments (once they are optimally tuned), trust in your compass (a call for serendipity)”.and then … right … there is some pedantry stuff in this … i feel it … but still …- what could ´transformative effects` be?- what are ´multiple activity structures`?- what is ´repositioning of self`?- should it be ´once you peer-ask for their optimal tuning`?I think we should open a wiki (google docs … what ever) for a shared (and public, open for everyone) production of an article/online text ,multimedia about PoS (or “you” name it!). These are the functional questions we should be addressing, so good points you raise. I think the purpose of my comments is to justify a path that seems/feels right, but at some point we would need to link it to pedagogy (or at least define our terms):- what could ´transformative effects` be?Good question. I suppose it would depend on the learning activity at hand. Could be a transformation from apprentice to practitioner (say, for formal education), a transformation in perspective (a changing context leading to a new outlook), etc. Something we would need to define a bit more. – what are ´multiple activity structures`?Also a good point we need to consider. I think it relates a bit to your pointilist, overlapping time activities. I think ultimately we participate in x number of activities/environments simultaneously. Many overlap, many are finite. I think we are always pushing on multiple fronts simultaneously, but much pedagogy seems to presuppose a linear progression. By multiple activity structures (perhaps contexts is a better word there), I mean participating in any number of unique (not exclusive) activities at any given time, all of which have learning potential. I think our mind is better able to juggle this complexity of doing many things at the same time better than much of our pedagogy!- what is ´repositioning of self`?I think this refers to orientation. So, I am doing say 10 things more or less concurrently. I switch from #9 to #10 and this requires a reorientation, a recontextualization of my learning stance. That is one repositioning: a certain reorientation to a new knowledge pursuit (like, say going from writing a poem to a laboratory experiment to learning to navigate a new city). Another might be a complexity of perception. So we stare at a painting and think we know it, then we move to the left and we know it differently, to the right, etc. We dim the lights at the context changes, we are repositioning both the object (painting) and self. It is a reorientation that causes new understanding. I think your pedagogies actually work in this example as well. – should it be ´once you peer-ask for their optimal tuning`?I like this and a good rephrase. Using network for tuning/adjustment. I think it is a bit of a pointilist and overlapping activity, isn’t it? This use of our networks. We can use them to gauge a hunch or hypothesis, we can use them to edit/proofread, we can use them to adjust and calibrate. We revisit this network at many points in the process, or even go so far as to just jointly co-author an entire work. As for the Wiki, does Google Docs support the multimedia as well as we might need it? If so, I am certainly game for using it. Otherwise, we can use a pbworks wiki or something like that. But I like the Google Docs approach. Perhaps DM me your email so I can invite you to one and then we can share it once we have a bit of structure to it. Or at least some words on a page!